FLETCHER, NC--(Marketwire - March 9, 2011) - Mr. Rooter Plumbing of Greenville and Ashville teamed up last month to help elderly North Carolina resident Mamie Barnes who had been living without a water heater for several months in the middle of the winter. When Mr. Rooter Plumbing of Asheville and Hendersonville and Mr. Rooter of Greenville came to the rescue, not only did they install the water heater free of charge, but ensured her plumbing was adequate for proper functioning of the new system. Before Greenville and Asheville Plumbing stepped in, Mamie Barnes had been living without hot water for three months. Once Mr. Rooter heard her distress, they were quick to install the water heater which was said to have cost an estimated $1300. Before the generous residential plumbing contribution, Mamie Barnes could only use hot water which she had boiled on the stove. Sam Coleman, Greenville Plumbing Mr. Rooter Manager, expresses his branch's generosity as an act of kindness which "makes us feel good." He continued "It's great to be able to help somebody out." "I didn't think I was ever going to have another water heater," expressed Mamie Barnes. She continued "It's the most wonderful Christmas I've ever had." Thanks to Mr. Rooter, Mamie Barnes will continue to enjoy her hot water from a water heater and not from the stove. Mr. Rooter Plumbing offers affordable Asheville plumbing and Hendersonville plumbing residential and commercial plumbing and drain cleaning services to Western North Carolina. 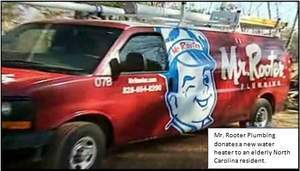 Mr. Rooter is available 24 hours a day, 7 days a week to help with all your Asheville and Hendersonville Plumbing needs.